Brand Anniversary. Seldom have 2 words in the English language elicited an equal amount of anticipation and indifference for a prospective attendee. I probably shouldn’t say it, but I completely understand why. How many times has one found oneself at a navel-gazing brandtastic uber-event for the somethingth anniversary of a brand that is completely missing the point? The point is this – everyone loves an unforgettable experience, something new, big, thought-provoking, immersive or refreshingly straightforward, delivered with elegance and (seemingly), ease. A graceful swan gliding across the surface no matter how furiously the production elements are intensely paddling beneath. At Private Drama, we salute the brands that continue to raise the bar in corporate storytelling, both in the recent event organising briefs we’ve received, those we’ve won and produced and those we admire from afar. Here’s a brief roundup of some of the best corporate events that have told unforgettable stories, which is the guiding philosophy of everything we do. 2014 was a hugely significant year across the globe as the Centenary of the outbreak of WWI was observed. In London, the iconic Imperial War Museum cleverly timed their re-opening to coincide with this moment, and commissioned Private Drama to deliver one of our proudest and most challenging briefs to date. How does one “celebrate” a reopening whilst also respecting and honouring the ultimate sacrifice of so many, to an international public who could by and large relate to the mixture of pride and grief from the first global war? Our solution – as often is the case – was to utilise dramatic theatre combined with sound and lighting to bring the tragedies and the triumph of the occasion virtually back to life. The museum’s collection of fighter planes and V2 rocket displays as well as soldiers’ travelling trunks and letters were paired with audio-streamed ‘voices’ telling each object’s story of its wartime experience, eliciting an immediate emotional reaction for the viewer. The effect was palpable and a discerning combination of admiration and intrigue to plunge the guests into the real stories of WWI and what it means to us all, literally and metaphorically. A very recent campaign that has enraptured the entire Private Drama team and indeed the brand’s core consumer was done by Grolsch in celebration of their 400th anniversary. By transforming billboards in urban centres into serve-yourself taps for consumers to enjoy a pint of Grolsch, the brand delivered an experiential campaign that communicated both generosity and grand gestures, showcasing the craft and tradition of their product through innovation. They further communicated the significance of achieving a monumental 400 years of existence commissioning artists to produce 400 pieces of art that were reproduced on Grolsch bottles, again wrapping their hero product within creativity and generosity. Another momentous brand anniversary was recently celebrated in May by Cunard cruise lines, in celebration of 175 years of ‘carrying guests between continents’ on the occasion of the exact date so many years ago that the Britannia left British waters bound for America. This was re-enacted in an ingenious meeting of the “Queens” – their flagships Queen Mary 2, Queen Elizabeth and Queen Victoria. This occasion was a chance for the general public to attend, and attend they did! Thousands of people lined the shores its original home port of the Mersey, arriving in the early hours of the morning to secure a prime spot to marvel at the ships’ performance of choreographed manoeuvres on the river, which included 180-degree turns. This was a grand brand celebration that not only showcased the company’s fleet, but brought to life Cunard’s legacy of premium service and expertise of its unique cruises that everyone aspires to enjoy some day. Even younger brands have come into their own in telling amazing stories, and one event that springs to mind is one a few years back that left behind one of the most awestruck and entertained audiences I’ve seen in recent memory. In 2010, Mace commissioned Private Drama to produce an event in celebration of its 20th anniversary at one of its major projects at the Tate Modern’s Turbine Hall. The international consultancy and construction company famous for building the London Eye, The Shard and delivering the London 2012 Olympic and Paralympic Games, turned the space over to our team who imagined an event that would focus the spectator’s attention on specific areas and dimensions of the intricate work Mace had created within. [HS1] Guests were treated to a dramatically lit arrival followed by a performance of light jugglers with colour changing LED clubs tossed high in the air with deftness and ease. What better way to showcase the height and immaculate restoration within? Just as guests turned back to canapés, a gorgeous Opera singer appeared on a high stage, accentuating the sheer enormity of the project to allow for such pure acoustics. 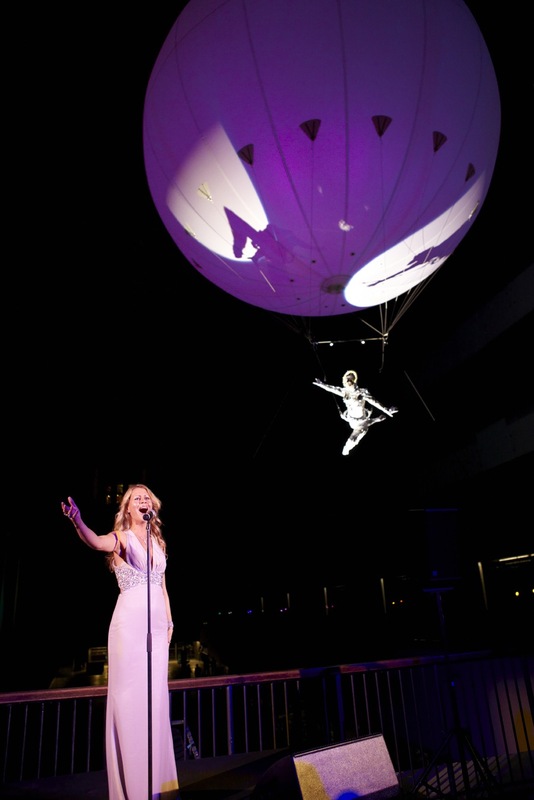 And then, the absolute showstopper… What all guests assumed was a 3D spherical light installation detached from the far wall, revealing itself to be a Heliosphere (the cover photo of this post) floating up and over towards the singer, with an aerial dancer rigged below, performing aerial ballet to the live Opera performance. Mace’s intention to showcase their mission to push boundaries and produce stunning projects was achieved. The increasing influence of social media and user-generated content has offered specifically exciting innovations in producing large-scaled events, and we’re currently working on one for the end of this month that we’ll soon reveal. Our remit as an event consultancy is naturally shifting into collaborating with clients to allow them to effectively “stretch” their stories and engage audiences before and longer after a gala event. We seek to create conversations, tease out intrigue and provoke imagination and anticipation while packaging up one clear story.